Random Blowe: Does MI5 Spy On Climate Camp? Does MI5 Spy On Climate Camp? 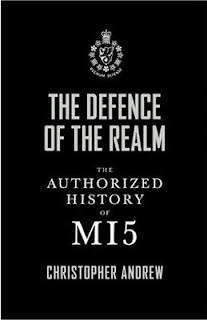 Cambridge historian Christopher Andrew's new authorised history of MI5, Defence of the Realm, has attracted considerable publicity over the last couple of days and this evening is number two (behind Dan Brown) in Amazon's bestsellers list. The book confirms a number of allegations made about the Security Services over the years, including the fact that it held a file on former Prime Minister Harold Wilson. Andrew, who says he had exclusive and unrestricted access to almost 400,000 files in MI5's archives, also confirms that MI5 has monitored CND leaders, Greenham peace protesters and, during the 1984-85 Miners Strike, the activities and communications of Arthur Scargill and the NUM's vice-president, Mick McGahey. Former MI5 head Baroness Manningham-Buller told Radio 4's Today programme on Monday that she hoped the new book would help people "have a better understanding of the complexity of some of the work and its limitations", but that it would probably not stop "conspiracy theorists who wish to believe in some way that the whole thing is a con but we knew that when we started on this project." It has often been alleged that, in the past, we systematically investigated trade unions and various pressure groups, such as the National Union of Mineworkers and the Campaign for Nuclear Disarmament. We have never investigated people simply because they were members or office-holders of trade unions or campaigning organisations. But subversive groups have in the past sought to infiltrate and manipulate such organisations as a way of exerting political influence. To meet our responsibility for protecting national security, we therefore investigated individual members of bona fide organisations when there were grounds to believe that their actions were "intended to overthrow or undermine parliamentary democracy by political, industrial or violent means". We investigated the activities of the subversive groups, but not the organisations they sought to penetrate. Any past investigations were carried out within the laws and processes agreed by Parliament at the time. "It does not matter if... people have views on the structure or organisation of Parliament or if they are involved in seeking to change industrial practices in this country or to negotiate a better deal if they are members of trade unions, or if they seek to challenge or change the Government's policies relating to defence, employment, foreign policy or anything else... Its [the Service's] sole criterion in relation to a subversive threat is whether there is a deliberate intention to undermine parliamentary democracy and whether that presents a real threat to the security of the nation." The subversive threat to parliamentary democracy in the UK is now negligible and we have no current investigations in this area. Andrew's book cast doubts on the first part of this statement and also raises questions about exactly how the Secuity Service decides who is a 'subversive' - the criteria has been extremely broad. But the claim that MI5 has 'no current investigations' concerning protesters seen as threats to parliamentary democracy is also intriguing, in part because of a small piece in the back of the current issue of Private Eye. Documents released to the magazine following a freedom of information request not only suggest collusion between the government and the British Airports Authority (BAA) over plans to force through the expansion of Heathrow, but that BAA was passed information from MI5 about the 'Camp for Climate Action' group. A document dated 25 June 2007 minuting a meeting between BAA and the then transport Minister Douglas Alexander says that BAA chief executive Stephen Nelson "raised the prospect of a Climate Camp near the airport between 14-21 August and said they were preparing for this." The following paragraph has then been redacted, stating that it contains 'information exempted under section 23'. Section 23 of the Freedom of Information Act says information is exempt if it is "supplied directly or indirectly by the Security Service bodies (this includes the Security Service, the Secret Intelligence Service and GCHQ as well as others)". So it seems that 'no current investigations' in fact means 'some current investigations' against peaceful environmental campaigners. It is tiny snippets like this that make it hard to believe what MI5 or its apologists have to say about anything. And this is why the claim that Andrew's book was vetted to protect "national security" rather than the Security Service from embarrassment seems like another huge whopper. In 1985, Cathy Massiter, an MI5 officer who had been responsible for the surveillance of CND from 1981 to 1983, resigned and made disclosures to a Channel 4 20/20 Vision programme, "MI5's Official Secrets". She said that her work was determined more by the political importance of CND than by any security threat posed by subversive elements within it. In 1983, she analysed telephone intercepts on John Cox that gave her access to conversations with Joan Ruddock and Bruce Kent. On the basis of Ruddock's contacts, MI5 suspected her of being a communist sympathiser and it was suggested that Bruce Kent might be a crypto-communist. MI5 placed a spy, Harry Newton, in the CND office. When Michael Heseltine became Secretary of State for Defence, Massiter prepared a report on CND for him. She was asked to provide information for Defence Secretariat 19 about leading CND personnel but was instructed to include only information from published sources. Ruddock claims that DS19 released distorted information regarding her political party affiliations to the media and Conservative Party candidates.